Easy-to-adapt free teacher resume templates help you create a resume that both reinforces your professional image and highlights the qualifications and skills you bring to the teaching job opportunity. Your teaching resume should clearly articulate the scope of your expertise and quickly convince the reader of your suitability for the teaching position. Select the teacher resume template that applies to your situation. This teacher resume clearly summarizes your credentials for a teaching job at either high school or middle school level. The resume objective summary is an excellent example of how to present your expertise and strengths in a persuasive and professional format. This sample art teacher resume establishes the job candidate as a successful educator who is passionate and innovative about delivering a meaningful art program to his or her students. Comprehensive kindergarten teaching resume that effectively demonstrates the experience and qualities you bring to this job opportunity. Find out how to write a convincing objective summary and how to format your work experience in a professional and easy-to-read format. Preschool teachers play a vital role in nurturing and developing young children. Early childhood educators can showcase their passion and expertise in helping young learners fulfill their potential in a professional and persuasive resume. Looking for your first teaching job can be intimidating. A well written resume that highlights your strengths and competencies as an educational professional will make it easier to land that first teaching job. This adaptable format enables you to persuasively present your value to a potential employer. This resume is an excellent guide to developing your own teaching assistant resume. The sample resume objective summary can easily be adapted for your own use and will quickly convince the reader of your suitability for the assistant teacher job. Present your knowledge and skills in meeting the social and educational needs of young children in a professional format. Highlight your sincere interest in child development and persuade the reader of your commitment and suitability. Many teaching job candidates find it a challenge to write clear, concise and convincing resume objective summaries. 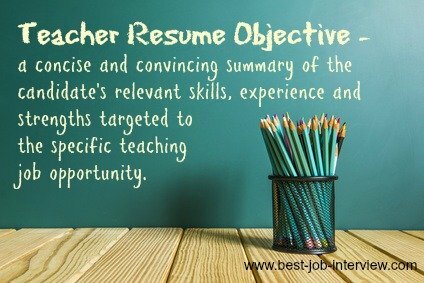 A powerful objective is an excellent way to begin your teacher resume. Use the examples to develop your own winning resume objective. These sample teaching job descriptions will help you to write a job-winning teaching resume. Send a resume with each teaching job application and be sure to customize your resume to the specific job opportunity and use the relevant resume keywords. The right credentials are essential to your job search success. Educators should highlight both their college degree and areas of certification within their own state on their resumes. When writing your teaching resume it is important to think beyond your classroom experience and to include extra-curricular activities, professional development, community initiatives, presentations, leadership roles and administrative responsibilities among others. Include a teaching cover letter with your resume that clearly showcases your expertise as an educator and highlights your key accomplishments relevant to the specific job opportunity. How do I write a cover letter for a teaching job? We all know the importance of submitting a good cover letter with your teaching resume and job application. We help you create a winning cover letter with these examples that can be adapted for your own use. When you land the job interview make sure you are well prepared to stand out as an excellent job candidate. 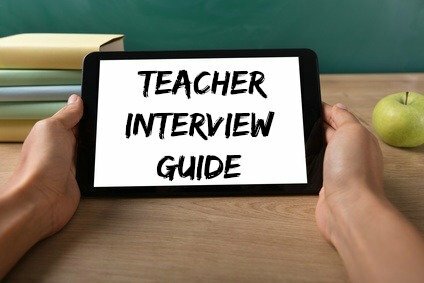 Our comprehensive guide to teaching interviews will ensure you are ready to shine in your interview.